The Black Bears will play in the national semifinals for the first time in school history next weekend. Maine quarterback Chris Ferguson directed an offense that had to work for everything against Weber State but came through with big plays, including a 67-yard touchdown pass to Earnest Edwards. The University of Maine football team has gone from an afterthought in its own league to one of the final four teams standing in the NCAA Football Championship Subdivision playoffs. The Black Bears were picked to finish eighth in the Colonial Athletic Association preseason poll. After Friday night’s 23-18 win over Weber State, they’re in the national semifinals for the first time. It’s hard to disagree. Maine did participate in the 1965 Tangerine Bowl, but its seven previous forays into the NCAA playoffs never got past the quarterfinals, where the Black Bears were 0-3 before Friday night’s game. Maine (10-3) will next play at Eastern Washington – a 34-29 winner over UC-Davis – at 2 p.m. on Saturday. 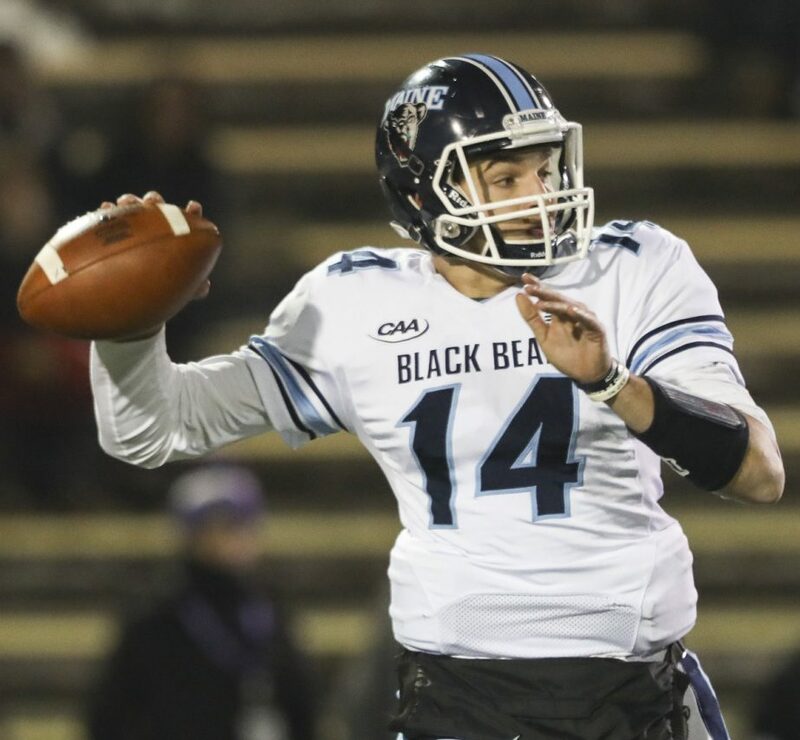 The Black Bear offense made just enough big plays Friday night – including a 67-yard touchdown pass from Chris Ferguson to Earnest Edwards and a clinching 45-yard run by Ramon Jefferson – to hold the lead. But it was the defense that shined brightest. Maine held Weber State to minus-1 rushing yards, intercepted four passes and had 13 tackles for a loss. It’s that accountability that has carried the Black Bears all season. This team rallied together even before the first practice of preseason, following the tragic death of freshman Darius Minor during a supervised workout in July. They found strength in each other, which has carried them through the toughest of times during the season. Maine, ranked 12th in the nation, has been overlooked all season, seldom being picked as the favorite in a big game. Yet the Black Bears are 7-0 against ranked opponents after beating No. 3 Weber State. “We’re underdogs each week,” said Ferguson. “And for us, we almost like to hear what people think. Then we just roll with it. It gives us more energy, more fuel. It makes us smile. They support each other. Even as the offense struggled at Weber State – just 3 of 15 on third-down plays – Ferguson and Belcher knew the defense would hold up its end. Kayon Whitaker, Sterling Sheffield, Taji Lowe and Deshawn Stevens led a dominant front seven that completely shut down the Wildcats. The secondary also was superb, with cornerbacks Manny Patterson (interception) and Katley Joseph (four pass break-ups) holding their own against Weber State’s speedy receivers. And when the game got tight, the defense was at its best. And Maine is moving on. “We’re where we expected to be at the start of the season,” said Ferguson. “The guys believed that, no matter what everybody else said. We’ve been underdogs, and we’ve taken that identity and rolled with it. But we’re not done yet. We’re not satisfied.